Complete U joint with Bearings replacing factory Spicer Dana 44 U-Joints; Replaces factory Spicer u-joints 5-297X and 5-760X;Full circle clips as well as half clips included;3 year limited warranty. Heavy Duty cold forged Alloy USA X-Joint is a complete U-Joint with bearings. A seriously beefy upgrade for Dana 44 style U-joints applications. 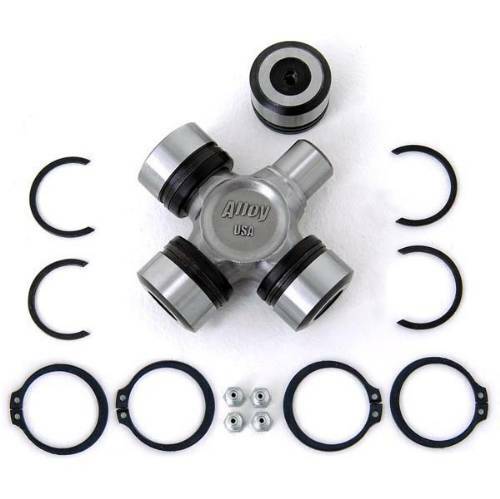 Replaces factory Spicer u-joints 5-297X and 5-760X. Serviceable grease Zerk at each cap allows you to flush grime and fill with grease to ensure that your X-joints will last for when you need them. Dependable cold forged steel composition made of chromium, molybdenum and nickel alloy. Hardened case for excellent wear resistance.